Brief Description Your favorite boozy winter-wonderland is back, Atlanta! Description Your favorite boozy winter-wonderland is back, Atlanta! Holiday pop-up cocktail bar Miracle returns this year with two unique locations. Bringing back its nostalgic Christmas spirit, Miracle on Monroe returns to the Midtown Promenade restaurant Tapa Tapa, conveniently located on the BeltLine and adjacent to Piedmont Park while the new Miracle Two location pops up at The Shops Buckhead Atlanta. Both locations will feature staff decked out head-to-toe in seasonal flair, themed events nightly, classic holiday décor, a Christmas Sweater contest and jolly good beverages to match. ‘Tis the season to get tipsy with expertly crafted cocktails! For more details on how to get into the holiday spirit at this festive joint, visit www.miraclebaratlanta.com. 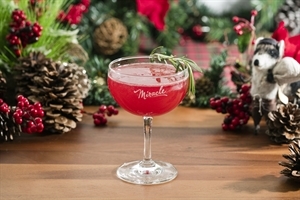 Add Pop-up Christmas Cocktail Bar Miracle Two to your free online travel itinerary.